Grandparents' Day writing project. There is a box to glue in a picture of the student and his or her grandparents. If there is not a picture available, the students can draw their own picture in the box. 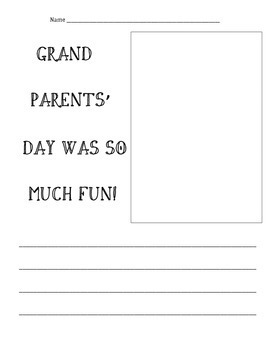 The students can write about their experience of grandparents' day on the lines below the picture. This page can be included in the end of year memory book, or just as a writing activity after a grandparents' day event.